The Chicago Theological Seminary Collection on Merom Institute is now processed and available for research. Originally donated to the Congregational Library from the Chicago Theological Seminary in 2011, this collection has been minimally processed for access using the "MPLP" standard. This collection contains institutional records of Merom Institute as well as records from its founder, A.E. Holt, president of Chicago Theological Seminary and others from CTS. This collection includes board meeting minutes, articles of incorporation, reports, receipts, correspondence, legal papers, historical sketches, and calendars. The Merom Institute was founded in 1936 as a Protestant ecumenical religious center offering a camp, seminars, lectures and various community activities. 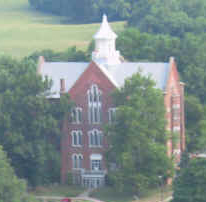 Located in Merom, Indiana it was the site of the previously closed Union Christian College. The Merom Institute was renamed the Merom Conference Center sometime in the late 1970s when it was taken over as a ministry of the Indiana-Kentucky UCC Conference. Arthur E. Holt, President of Chicago Theological Seminary in the 1930s, was an instrumental founder of the Merom Institute. After President Holt's death in 1942, the Chicago Theological Seminary kept close institutional ties with the Merom Institute under its next president, A.C. McGiffert, and beyond. Please see the finding aid for more details.